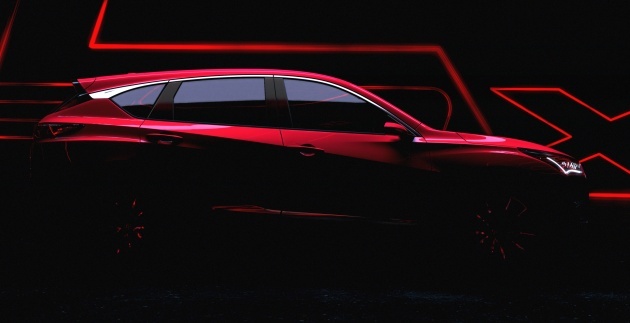 Acura has teased the new RDX Prototype ahead of its world debut at next month’s 2018 North American International Auto Show (NAIAS) in Detroit, showing the top half of the upcoming third-gen SUV via a side silhouette graphic. The new RDX, which is set to go on sale in the US next year, represents the most extensive Acura redesign in more than a decade. Designed and developed for the first time in America, the vehicle will feature exterior design elements from the Acura Precision Concept from 2016, adapting the low and sleek lines of the sedan study to an SUV. The automaker says that the RDX will also get an all-new interior, user interface and operating system designed from a clean sheet, with that seen on the Acura Precision Cockpit providing cues on what to expect – the cabin study had bits borrowed from the NSX and two 12.3-inch screens for its instrumentation and infotainment systems, among other things. The current second-gen RDX has been around since 2013, with a facelift appearing in 2015. It’s powered by a 279 hp and 341 Nm 3.5 litre V6 NA mill with cylinder deactivation technology. Reports indicate that the new RDX will likely feature a 2.0 litre i-VTEC turbocharged four-pot, as seen in the 2018 Accord. That one makes 252 hp and 370 Nm in that application. Pity we got no Acura in Malaysia. Such a good car. Sad that in Malaysia, our freedom to buy is hindered by the fact that Potong needs protection. Katak dunno Acura is only US exclusive brand. D’oh! Yeah. I bet he don’t know it is actually Honda’s brand. Katak di bawah tempurung john. Malaysia had Acura Legend before also known as Honda Legend. Err. U just admitted that Acura no longer becomes Acura when leaving US. Double D’oh! So it has cabin bits shared with the supercar NSX. Sadly the cabin of the new NSX is dull and unimaginative. The exterior looks amazing though. Hope it looks nicer than the NSX on the inside, and can almost match the NSX on the outside.